Stuart Katchis, M.D. is a leader in hammertoe correction surgeries and has helped hundreds of patients by eliminating pain and dramatically improving the appearance of toes. Whether your condition has just recently developed and can be effectively treated with nonsurgical options, or it is more advanced and requires surgery, Extend Orthopedics will tailor and implement a treatment plan that is best for you. For those patients needing hammertoe surgery, Extend Orthopedics is pleased to offer a cutting-edge procedure called Nextradesis® that uses a proprietary implant device Dr. Katchis helped develop. The state-of-the-art surgery delivers more stability, precision, superior bone fixation and, best of all, faster recovery times for patients. Hammertoe occurs when the muscles of one or more toes are tightened and constricted over time and unable to stretch out, resulting in a permanent bend. The majority of hammertoe cases result from tight or uncomfortable shoes that force the toe(s) into a bent or flexed position for an extended period of time. Other foot anatomy factors such as having a second toe that’s longer than the big toe or the presence of a bunion can cause this condition to develop. If you have a hammertoe, you may have difficulty finding comfortable shoes. Since it is a progressive condition, your symptoms will gradually worsen over time if you do not receive treatment. What are the risk factors for hammertoe? What are the treatment options for hammertoe? If you are experiencing pain, irritation, calluses/corns or a persistent bent position in one or more of your toes, call our office at 212‑434‑4920 or fill out the schedule appointment form on this page so Stuart Katchis, M.D. can evaluate and diagnose your condition. Hammertoe is a progressive condition that gets worse over time and treatment outcomes are significantly improved if medical evaluation is sought when symptoms first start. In many cases, hammertoe can be successfully treated with nonsurgical methods if it is tended to in its early stages while the affected toe is still flexible. Tight, narrow shoes and high heels that bind the forefoot and force the toes into a bent position should be avoided and traded out for shoes with a large toe box that comfortably fits all your toes. Inserts placed in the shoes can help relieve pain by repositioning the foot and reducing pressure on the affected toe(s). There are a number of stretches and strengthening exercises that can help the toes and reverse the muscle imbalance causing the hammertoe. Dr. Katchis may recommend that patients see a physical therapist for treatment. Surgery may be recommended if nonsurgical treatments will not prove effective for improving symptoms and relieving pain, particularly in cases of more severe hammertoes. The type of surgical procedure recommended by Stuart Katchis, M.D. will depend upon each patient’s unique situation. A procedure that may be used in earlier stages of hammertoe, when the toe is still flexible, or in conjunction with another surgical procedure, the surgery involves Dr. Katchis carefully removing tendons from under the affected toe. The tendons are then rerouted, or transferred, to the top of the affected toe to help pull the bent joint into a straight position. A cutting-edge arthrodesis (fusion) procedure for more advanced cases of hammertoe that mends the affected bones through surgical fixation of the interphalangeal joint(s) in the toe. 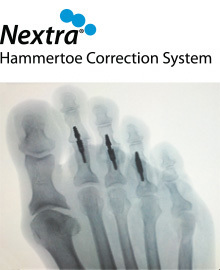 After removing the deviated small joint(s) in the affected toe, Dr. Katchis will precisely insert a proprietary hammertoe correction device called the Nextra® into the toe that can be customized to each patient’s unique toe anatomy. The device enables the bones to fuse together and heal in a flat position over the course of several weeks. A procedure that involves Dr. Katchis removing a portion of the deviated small joint in the affected toe to promote straightening. The surgery provides more room for the affected toe joint to straighten out. 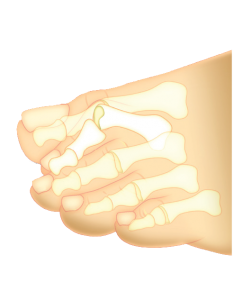 Surgical treatment for a hammertoe involves several weeks or months of recovery depending on the type of surgery performed. With any type of surgery for this condition, it may require you to wear a firm and flat postoperative shoe to protect your foot while the bones heal. Whether you undergo nonsurgical or surgical treatment for a hammertoe, Stuart Katchis, M.D. will provide recommendations for long-term measures designed to keep your symptoms from returning, such as footwear modifications, wearing orthotics and toe strengthening exercises.